BUY THE SET AND SAVE $1.00! A thorough analysis of prehistorical pre-Christian Britain. This scholarly account includes detailed descriptions and information of an ancient land with its strange mounds and circles that bear witness to Britain's early culture and religion. 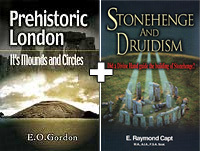 The author compares the mounds and circles in Britain to those erected by Moses and Joshua pointing to their similarity and elaborates on the close connection between the religion of ancient Israel and that of British Druidism. This is a book that is so full of captivating historical facts and intriguing conjectures that one hardly knows where to begin to focus for such a brief account as is possible in a summary. But the fascinating evidence revealed through the honest efforts of serious research has given us a wealth of striking characters from the race of people who have inhabited this beautiful land from its earliest days. One especially noteworthy proposition is the author's conviction of the kinship between the Trojans and the British and the evidence she gives to support her position. Consequently much of the book expounds on this relationship and supplies a great deal of fascinating detail elaborating on the Greek influence upon British culture and later on the influence of Rome. A variety of illustrations are scattered throughout the book which enable the reader to better understand how the mounds and circles appeared when they were in use and these are supported by two excellent Appendixes by the Rev. John Griffith dealing with archaeology and measurements. This book deals with the age old question of: the purpose of Stonehenge who the master-builders were and when it was built. Although not counted as one of the seven wonders of the ancient world Stonehenge does count as one of the most unique wonders of the world. A monument so old that it's true history was probably forgotten by classic times. Greek and Roman writers hardly mention it. Stonehenge stands today one signpost left along the way that identifies the Building Race. It bears witness to the vigour and vitality of a national religion already passed from the primitive into the metaphysical stage which embodied abstract ideas astronomical observations and a high and pure code of ethics.